The bundle contains 24 highly reusable excel templates for project planning, task management, timesheets, issue tracking, risk logging, status reporting and more. The templates come in 2 versions – Excel 2003 and Excel 2007. 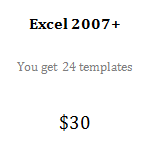 The bundle costs $30 for Excel 2007 or Excel 2003. 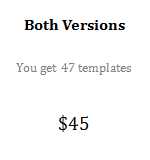 You can buy both the versions for $45. What will you get when you buy these templates? 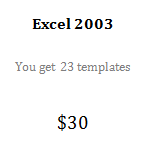 * If you are purchasing Excel-2003 version of the templates, you will get only 3 chart templates. Who can purchase these templates? The “Project Management Templates for Excel” toolkit is aimed at project managers and analysts who use excel to manage their projects. The templates are designed keeping the project managers in mind. You need just the basic knowledge of excel to start using these templates and make a difference in your projects. The “Project Management Templates for Excel” toolkit comes in two versions. One for Excel 2007 and above, another for Excel 2003. The templates use excel features like Data tables (or lists). So I don’t recommend you to buy this toolkit if you are running Excel 2002 or earlier versions. If you do not like the templates or have any other reason for returning them, please write to me at chandoo.d @ gmail.com and I will refund your payment. No questions asked. That simple! We have opened a separate discussion forum area for the members who purchase the project management templates. Please log in to PHD Discussion Forums and ask your questions there. I will reply to you and resolve any questions you may have in implementing these templates. Also, limited amount of support is available through e-mail. Feel free to write to me at chandoo.d @ gmail.com and I will get back to you at the earliest. Click here and download your copy of project management templates for excel today. @DisappointednBroke: Thanks for your comments. Usually sales pages do not contain option for comments for the same reason. I am sorry to know that you think the price is steep for these templates. I have done some research and realized that several sites sell excel templates for $5 a piece. If you look at that, these templates are almost 1 dollar a piece. Given the fact that there is one VBA application, 2 dashboards and almost everything is completely automated the price seemed reasonable to me. It is barely one day since the bundle is out and so far I have sold more units than I had imagined. I have also asked all the buyers to share their feedback and the comments I got are very very encouraging. Chandoo - LOL. Fair enough. My admiration for you has climbed even higher. When you mention the # of items again (for my stubborn brain), the price does indeed seem fair... Please don't lose hope in your users based upon my feedback. Again, I think this site ROCKS. Will be dusting the cobwebs off my wallet and placing an order (@ full price because I missed your original generous offer - and you have new babes to keep fed and diapered - CONGRATS, by the way!). Please keep up the great work! Just kidding. I hope you found the bundle useful. Let me know how you are implementing the same. I have sent several e-mails requesting support, but haven't heard back - so I thought I'd try this. Could you please check your email and get back to me? My questions were regarding versions (I somehow purchased 2003 not knowing you had 2007 which I would rather have). Also, I need to know how to add more rows to the Gantt chart - having real difficulty with this. Thanks - your templates are great, and I look forward to deploying them in our organization when I get these issues resolved!